Osteria di Tramonto at the Westin Chicago North Shore in Wheeling has closed and is undergoing a concept change, according to Dan Egan, Director of Sales and Marketing at the Westin Chicago North Shore hotel (601 N. Milwaukee Ave., 847-777-6500). The new, yet-to-be-announced concept will be under new management, independent of Cenitare Restaurants, the restaurant’s former operators. A fall opening is expected. 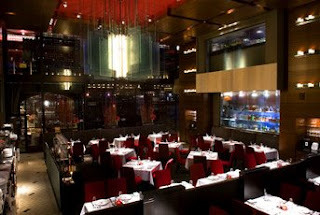 During the transition, the Westin Chicago North Shore is operating Tramonto’s Steak & Seafood, the hotel’s popular steak and seafood restaurant, and the RT (sushi) Lounge. Tramonto’s is now open continuously beginning at 6:30 a.m., serving breakfast, lunch and dinner. Tramonto’s Steak & Seafood dinner hours are 5 p.m. to 10 p.m. Monday through Thursday, 5 p.m. to 11 p.m. Friday and Saturday, and 4 p.m. to 9 p.m. on Sunday. RT Lounge is open from 5 p.m. to midnight Monday through Thursday, and from 5 p.m. until 1 a.m. on Friday and Saturday. It is closed on Sunday. Chicago North Shore residents and travelers to the area have always appreciated the hearty American breakfast offered at the Westin. Voted among the top spots for business breakfast and lunch, the menu boasts an array of specialties including Belgian Waffles – simple, nutty or fruity ($6-$7), Steel Cut Oatmeal and Roasted Apples with raisins and brown sugar ($6.95), Gravlox ($8.95), and, of course, a variety of Egg Dishes served with home-style potatoes and a choice of breads ($9.95). Other favorites include Omelet Your Way with a choice of three ingredients ($9.95), a Breakfast Sandwich (9.95), Eggs Benedict with Canadian ham and hollandaise ($10.95) and Steak & Eggs with beef tenderloin medallions and two eggs as you like ($14.95). Variety is the keystone of the restaurant’s American menu. Starters include New England Clam Chowder ($5.95), Crispy Calamari ($9.95), French Onion Soup ($6.95), Steakhouse Chopped Salad ($9.95), Caesar Salad ($7.95) and Spinach Salad with goat cheese, red onion, candied pecan, and bacon vinaigrette ($7.95). Guests can add chicken for $2.95 or shrimp for $4.95 to the salads. Popular priced lunch entrées include Midwestern favorites like Sautéed Lake Superior Whitefish with wood roasted carrots, mint and walnut agrodolce ($11.95); Pan-seared Scottish Salmon with beets, spinach and sherry vinaigrette ($14.95); Chicken Parmesan and Spaghetti with basil, provolone and Pomodoro sauce ($10.95); Chicken Scallopine with arugula and lemon vinaigrette ($12.95); and a 6 oz. center cut Filet Mignon with caramelized onion and arugula salad ($21.95). Several pasta dishes are featured including, Absolut Pennetti with diavolo sauce ($8.97) and Pappardelli with Meat Sauce of veal, port and beef ragu and fresh ricotta ($10.95). The menu features seven sandwiches and burgers which are served with a choice of garlic fries, market vegetables or fresh fruits. Among the selection are Vegetable Panini, Tuna Salad, BLT and Chicken Parmesan, all for $8.95 each. The Pesto Grilled Chicken sandwich and Build Your Own Burger with choice of three toppings are both $9.95. The Steak Sandwich with chili aioli, escarole, Fontina cheese and crispy shallots is $11.95. Dinner at Tramonto’s Steak & Seafood is an occasion that can be celebrated often. The restaurant gives new meaning to the term steak and seafood restaurant, as it offers a wide variety of selections rarely found at restaurants in the same category. Fresh shellfish and seafood platters for two guests or more are custom designed and filled with hand-picked daily specials representing the ocean’s bounty. Combination platters ranging from $16.95 to $34.95 per person are available, and include items such as jumbo shrimp, oysters, chilled mussels, cracked king crab and Maine lobster tail. Appetizers range from RT Spicy Tuna Roll, Yellowfin tuna tartar, spicy mayo, scallions and shrimp tempura ($8.95); Sliced Hamachi Sashimi with miso-pineapple emulsion, chili aioli and fried shisho ($9.95); Wood Oven Roasted Escargot ($7.95); Grilled Kobe Beef Sliders ($9.95); Prime Beef Carpaccio ($10.95); Tuna Tartare ($11.95); Lobster Risotto ($15.95); Wood Oven Oysters Rockefeller ($10.95); Seared Jumbo Lump Crab Cake ($13.95) and more. Not to be missed are the signature Seared Hudson Valley Foie Gras with candied beets, herb crepe and cherry gastrique, or the Whole Roasted Foie Gras serving six for $75.95 (seasonal preparation changes). The menu offers five cuts of USDA Prime beef, both wet- and dry-aged, sourced from the Midwest. Whole prime ribs are seared in a wood-burning oven, while other cuts are seared on a 1,200-degree high-speed broiler; most of the steaks are finished in the wood-burning oven. Toppers for the steaks include sliced bone marrow, truffled poached eggs and seared foie gras. Choose from the signature Filet Mignon, 6 oz. and 8 oz. center cuts ($26.95/$29.95); Prime New York Strip, 12 oz. Midwestern corn-fed ($34.95); Wood Oven Bone-in Rib-eye, 20 oz. Midwestern grain-fed ($40.95); Prime Porterhouse, 25 oz. Midwestern grain-fed ($54.95); and the Wood Oven Dry-Aged “Tomahawk,” 40 oz. bone-in rib-eye for two ($79.95). Other steak specialties include Skirt Steak Frites with caramelized onions and frites ($21.95); Horseradish-Crusted Filet, 8 oz. center cut ($30.95); Filet Oscar, 8 oz. with crabmeat and béarnaise sauce ($35.95); Prime New York Strip Al Forno, 12 oz. with parmesan and garlic crust ($36.95); and Wood Oven Bone-In Filet, 16 oz. with seasonal forest mushrooms and natural jus ($53.95). Au Poive, Béarnaise, Red Wine, Bordelaise and Horseradish Cream steak sauces can be added for an additional $1.95 each. Seafood selections include Maine Lobster Tail, 6 oz. ($27.95), Lobster and RT-Style Spicy Tuna Roll ($36.95), Lobster and 6 oz. Filet ($53.95) and Lobster and Sautéed Foie Gras ($45.95). Twin Sixes, two-6 oz. Tails ($55.95), Alaskan King Crab Legs by the pound ($37.95), Crab and 6 oz. Filet ($63.95), Crab and 6 oz. Lobster Tail ($65.95) and Crab and Sautéed Foie Gras ($55.95) are also featured. Fish and seafood specialties include house favorites Miso Glazed Chilean Sea Bass with five grain wild rice and baby bok choy ($27.95), and Seared Spice-rubbed Yellowfin Tuna with fennel puree, orange segments and citrus emulsion ($27.95). Other house favorites include Wood Oven Amish Chicken with braised fennel, bacon, apple and haystack potato ($19.95), Braised Short Rib with roasted garlic mash, braising jus and baby greens ($25.95), and Grilled Double-Cut Lamb Chops with Dijon bordelaise sauce ($35.95). The menu offers a variety of soups and salads as well as vegetables and side dishes. Liquid assetsThe 3,000-bottle international wine list includes 25 choices by the glass. Flights of four 3-ounce glasses chosen by the sommelier are offered for $24. Traditional cocktails are updated with fresh juices and chipped ice. Enjoy half-priced bottles of wine every Sunday at Tramonto’s Steak & Seafood. Choose from the expansive wine over more than 1,500 varietals, including a Silver Lake Chardonnay ($30), to a 2004 Silver Oak Cabernet ($300). The entire wine list is discounted each Sunday. Architectural features at Tramonto’sA two-story water wall, a two-story enclosed glass wall for storing and displaying 10,000 wine bottles, a glassed-in kitchen with red tiles and a 3,000-pound glass chandelier. Tramonto’s Steak & Seafood in the Westin Chicago North Shore Hotel, 601 N. Milwaukee Ave., Wheeling, Ill. 847-777-6575. Hours: Breakfast: 6:30 a.m. to 11 a.m., Lunch: 11 a.m. to 3 p.m. Limited Lunch: 3 p.m. to 5 p.m. Dinner: 5 p.m. to 10 p.m. Monday through Thursday; 5 p.m. to 11 p.m. Friday and Saturday, and 4 p.m. to 9 p.m. on Sunday. RT Lounge is open from 5 p.m. to midnight Monday through Thursday, and from 5 p.m. to 1 a.m. on Friday and Saturday. It is closed on Sunday.